Toyota has refreshed its entry-level sedan, the Etios, in an effort to make it more appealing to personal car buyers. A spacious and practical car, the Etios has been around for over five years and is a popular pick in the taxi-fleet market thanks to its affordability, low running costs and reliability. However, it hasn’t seen much success as a personal or family car, and that’s mainly down to its dull looks and unappealing interiors. With this makeover, which gives the sedan a new nose section as well as a host of new features, Toyota is looking to address just that. Test drive for Toyota Etios . To begin with the design aspect, the new Platinum Etios looks more elegant from the front. The new front grille somewhat matches the design of the new Baleno. I’m not comparing, but one cannot deny the similarity. There is a thin chrome lip that makes it look more upmarket. Other than this, we cannot spot any major changes at the front.Side looks the same like before. The rear gets a new chrome strip with Etios embossed on it. This is just like the Innova and the Fortuner. The Platinum Etios gets these many changes on the outside. Nothing else is offered as new on the titivated version of the sedan. Even on the inside, the updates aren’t easily seen, but look closely and you’ll spot a pleasant change. The instrument cluster, while still placed atop the centre console, has a better looking layout and includes a digital tachometer along with the analogue speedometer. The black and ivory interior colour combination looks nice and mature, but the plastic quality is still quite hard and lacks the premium touch you’d expect at this price. The feature list still isn’t anything to write home about, but while the flat-bottomed, leather-wrapped steering wheel and 2-DIN sound system have been carried over, you also get a height-adjustable driver’s seat as standard on all variants. The wing mirrors are now foldable on the top-end VX/VXD grade too. The cabin’s utility has improved as well and apart from the addition of a well-sized rear armrest, the rear backrest folds down to open up more storage space. We would’ve liked integrated cup-holders in the armrest and a 60:40 split seat, but that’s just nitpicking. The boot space drops 3 litres to 592-litres (to accommodate the armrest console), but even so, the Platinum Etios offers segment-leading cargo space.No compromise on the Etios’s main selling-point either – comfort. The cabin is spacious, the seats are supportive and well-cushioned and the 1,695mm width equates to good shoulder room for 3 adults at the back. The five-speed manual transmission is smooth and sleek. The throws are short and one doesn’t struggle to shift. This is what makes the transmission smooth.Despite being peppy, the Etios has phenomenal fuel efficiency for both its engines. The petrol returns about 13 km/l in the city and about 17 km/l on the highway. This is if you drive comfortably and do not go pedal to metal. The diesel has impressive economy too. In city, it returns about 16 km/l, while on the highway it gives about 21 km/l with ease. Toyota Platinum Etios is endowed with a MacPherson Strut type suspension system for the front axle. Its rear axle has torsion beam type suspension. The turning radius of Toyota Platinum Etios is 4.9 m and it offers a minimum ground clearance of 170 mm.Ride quality is good and it can handle most potholes without much fuss, while its behaviour is composed on the highway too. The steering is a bit heavy, but there isn’t much feedback. By no means will it please an enthusiast, but it’ll do just fine for your daily drive needs. Toyota Platinum Etios has ventilated disc brakes for the front wheels and drum brakes for the rear wheels. Platinum Etios comes loaded with safety features like Anti-lock Braking System (ABS), SRS airbags, Electronic Brakeforce Distribution (EBD), traction control, engine immobilizer, keyless entry, driver seatbelt warning and door ajar warning. Toyota Etios On-Road Price in Bangalore ranges from 8,27,703 to 10,78,777 for variants Etios G and Etios VXD Platinum Edition respectively. Toyota Etios is available in 8 variants and 7 colours. Below are details of Toyota Etios variants price in Bangalore. 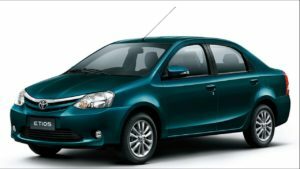 Check for Etios price in Bangalore at Carzprice. The Etios has always had the makings of a competent, if slightly bland, family car. It’s impressively spacious, very comfortable, and what makes it even more sensible is that it is low on maintenance. It is now also one of the safest cars in its segment; Toyota is likely to get an overall four-star Euro NCAP rating for this facelift, thanks to the added safety equipment on board. With the recent update, the Etios is now better looking, it’s also a bit more refined and more comfortable. However, it’s slightly costlier than before, and as always, it’s pricier than better-equipped compact sedans. That said, if safety, space, practicality and ease of ownership are high on your priority list, the facelifted Etios is surely worth considering.